Watch his famous 'Last Lecture' if you have not done so, it's a fascinating document of life! To celebrate that we are still alive, check out my latest wicked reflection video on the AmsterS@m YouTube channel! This is the photo version! There's a storm coming our way, so stay inside and cover up in one of the funkycool shirts from the AmsterS@m Online Shop, it's the only safe thing to do! I have personally used this rainy day to refresh the design of this page, check out the new icons in the menu to the left, I've also added links to my spanking new AmsterS@m Books thingie and the wicked AmsterS@m Videos, more info below! It's a good thing that the storm didn't hit Europe last weekend, during the Loveparade in Germany! Too much Love for your taste? 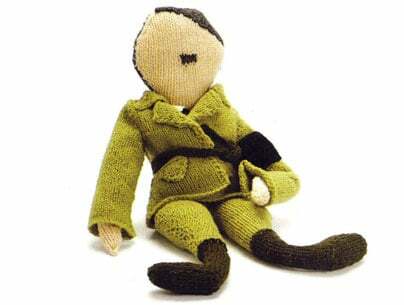 Keep those idle hands busy by knitting a Hitler! Did that offend you? Calm down by watching my first Video on YouTube! Last week Ice Cube was in Amsterdam, so I've uploaded my second video to YouTube today, for your entertainment, it was a good day...Westsiiiide Biatch! I've done it! I've created an AmsterS@m YouTube account today and uploaded my first video, it's reallyreally wicked, check it out!!! We went out last night with a big group of happy shiny people to celebrate life&stuff, but we made the BIG mistake of going to a place called 't'Arendsnest', the shittiest Bar in the world! It turned out that they were rude, ugly (on the inside! after all beauty is only skin-deep, hehe) people that did not want us to enjoy the few remaining liberties that help making life in the best city in the world even so much more spectacular and they refused to serve any more drinks to some members of our entourage (shocking! ), so we decided to leave after just a few beers to unload our buckets of money elsewhere. the shittiest Bar in the world! *Get a couple of AmsterS@m Shirts! *Be alert, look alive and act like you know! If your urge to fiddle around with something overpowers you in a Non-smoking area, you could wrap your yellow fingers around the newly realesed 'Jesus-Phone-version 2.0' to keep them busy! Steve says 'Just Do It'! Can't get one because you were too lazy to go to the Midnight-launch-parties?! Keep yourself distracted during the 6-weeks waiting period to receive yours by looking at random moments representing life in the best city in the world! Luckily for all the smokers in the best city in the world it has been very nice weather since the new Anti-smoking law has been inflicted upon our lifes on the 1st of the month. The streets are crowded while the bars, restaurants and coffeeshops are pretty much completely empty, everybody is outside, puffing away and enjoying the lovely sunshine...I'm a bit worried about the Rain-season and the actual Winter though!